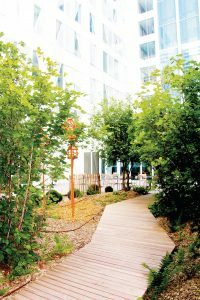 There is now a sustainable digital infrastructure where Yves Rocher and other famous brands are based. The offices in the elegant Cap Rocher can be provided with up to 10 Gigabit Ethernet in the future and promote a collaborative style of work. Project: Local data network for the headquarters, 2014. Application: Structured cabling in spacious office premises with Cat. 6A copper connection technology and FO backbone. Use of angled panels. Security system with color coding of ports and patch cords as well as lockable connectors. 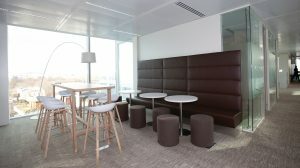 The new headquarters of the Groupe Rocher in Issy-les-Moulineaux – called Cap Rocher – distinguishes itself with healthy workplaces and sustainable, environmentally-friendly architecture. Since 2014 the family company has been doing everything in its power to enable employees to work together creatively at digital workplaces on office and lab premises covering 25 000 m2. Even the local data network was to promote the collaborative way of working and be usable long term. This is why a uniform end-to-end solution and durable infrastructure were in demand. It should support future applications such as 10 Gigabit Ethernet and demonstrate high product quality. The customer also desired flexible and simple administration of the network as well as a security solution for RJ45 connectors. And naturally, the LAN also had to fulfill the special requirements of the research lab. Project partner and system integrator SNEF Group selected an end-to-end solution for Cap Rocher on the basis of the LAN Cabling range from R&M. Planning followed the tried-and-tested principles of structured building cabling, but made tough demands on product and transmission quality. The copper cabling terminations were therefore equipped with the Cat. 6A high-performance module from R&M. In total, Cap Rocher was given 5500 copper links. An FO infrastructure is used as backbone. The core equipment with distributors and other functions was housed in two technical rooms. The 250 angled panels simplify cable management at the racks as well as the patching of patch cords. Coding solutions from R&M, such as the color coding of ports, provide more security for network administration. Patch guard fuses lock connectors in shared areas and prevent manipulations and operating errors. Bruno de La Barre, Project Manager in the IT department at Cap Rocher summarizes his experience with the installation of the R&M solution as follows: “The decisive factor for us was implementing a uniform complete solution that ensured quality of service right through to the workstation. We carried out several performance tests, each time with excellent results. Performance was also above average when it came to failure safety which indicates sustainable quality.” The innovative products from R&M impressed him. Cyril Landois, Project Supervisor and Installer at SNEF, confirms: “The performance tests were totally convincing.” Furthermore, R&M provided outstanding support throughout the project.